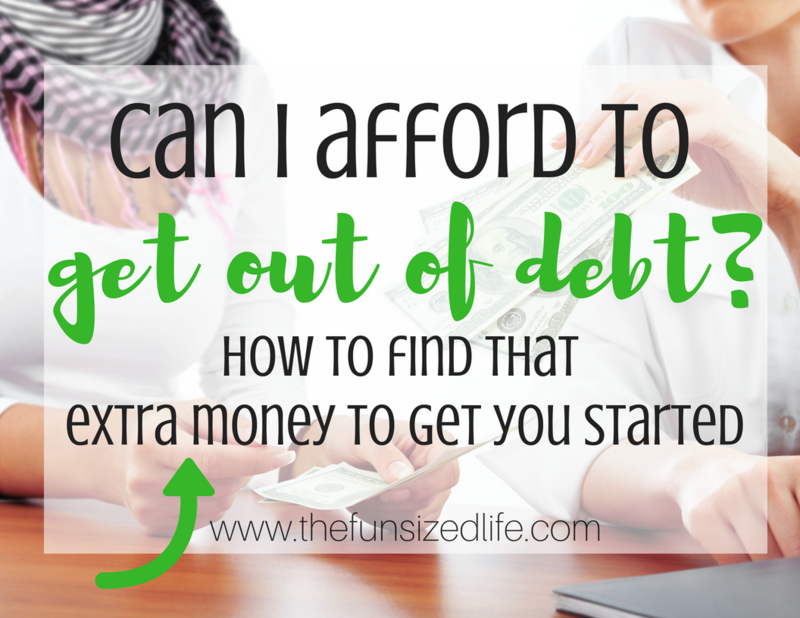 Can I Afford to Get Out of Debt?! How to Find That Extra Money to Get You Started. Debt. Chances are it is running you dry, ruining your life and yet somehow you can’t seem to shake it. Trust me, I’ve been there. In fact, I started to think it was a normal thing to rack up debt and then pay it off. I thought having credit cards was actually beneficial. If you’re not sure where you’re at, you can check your FICO credit score to find out. When I think back on the crazy amounts of money I wasted all while staying in debt, I could kick myself. Most days I spend wishing I could go back in time and change it all, but I can’t. Neither can you. No matter what your financial situation is, you’re in it. Wishing to change the past won’t work, so let me tell you what will. I’ll share your exact steps to save money, get out of debt and say out for good. These steps may not seem easy; they aren’t, but sometimes you’ve got to push your comfort zone in order to see the results you crave. Once you are ready to sit down together, it’s time to dive in and start dissecting your budget. Before you can start improving your financial situation, you have to get down and dirty with what the actual situation is. Get started with the steps below. Find your average amount spent on gas each month. Find your average amount spent on groceries each month. If necessary, create a separate total for the amount spent on out-to-eat foods. Once you have these 3-4 numbers down, it’s time to move on to find out just how much money you have (or don’t have) left at the end of the month. To get started with a budget, I recommend using the budget printout in my Fun Sized Budget Bundle. It’s a very simple basic budget starter that is easy to follow and is perfect if you are new to budgeting. Get started with a simple budget by figuring out if you can afford the budget you’re currently on. Follow the steps below and make sure you don’t leave anything out. Subtract your expenses. This includes things like mortgage, car payments, credit card payments, daycare expenses, medical bills etc. By doing this, you should get a general idea of what type of financial situation you are really in. This can be eye-opening especially if you have never done a budget before. Where you go from here will depend on whether or not you had money left over after doing this quick budget. Do you have at least 10% of your income remaining? If so, this should be getting put into savings before you start paying your bills. If you do have 10%, how much more do you have remaining? What part of your debt can you start paying this toward? Follow my Debt Snowball payoff plan. Can you start planning for Sinking Fund savings? Do you need more money to meet your financial goals? If so, see my recommendations below. I know it can be stressful if you don’t have money left after doing your basic budget. Even more stressful if you have a negative balance. That means it’s time for some serious damage control! You have got to find ways to take charge of your situation before you find yourself in an irreversible situation. Imagine you had a close friend, family member or child who desperately needed $5,000 for a serious, life-saving procedure. How quickly would you be able to come up with the money in order to help save your loved one? You would resort to drastic measures to make this happen. While it might not be a human life, your finances require just as much motivation if you want to undo your current situation. If you find you are coming up short or don’t have enough money to reach the financial goals you have planned, then there are some things you can change about your current situation. In fact, you may be missing out on $10,000 a year! Go through your budget and add up any additional expenses. How much did you over-spend? Cable – Try a Netflix membership, digital antennae, or no TV at all. Gym memberships – See how to start a home gym for the same cost as a monthly membership. Look into reducing your energy bills. Start planning inexpensive meals. Like my $10 a week breakfast plan. Shop with coupons and rebate apps. See how to take advantage of both. If you are paying off multiple debts and/or are paying high interest on your debt, consider consolidating by taking out a loan. Loans from $7,500 to $100,000 – Best for multiple large loans or to lower your interest rate. After reviewing your miscellaneous expenses, take note of how much money is wasted on these un-necessary things and stop doing it right away. If you are putting additional money on credit cards each month, time to cut them up to prevent yourself from racking up additional debt. You can start selling today with Decluttr. Try selling on Facebook Marketplace, Ebay or Amazon. –In fact, one family was able to make over $100,000 in a year by selling on Amazon! Get their free report. Let’s be honest, there is only so much that you can remove from your budget. While selling unused items can be a great additional income, there is also only so much that you can sell. When you have cut all you can, sold what you are able, and still find yourself coming up short (or barely getting by) it’s time to look into what you can do to make an additional income. Personally, I am thrilled at how easy it is for people to make additional income these days. I have written several posts on working from home, working for yourself and other ideas on how to bring in revenue. For the sake of time, and debt payoff, let’s work our way through some of the best ones to start. The following income streams allow you to choose when you work. This way you can work around your schedule but still get started earning right away. They also have little to no start up cost! AirBNB – If you have an additional room to rent, you can start earning money with AirBNB. Some families have even chosen to rent out their entire house and will stay with relatives in order to help pay off debt. See how much you could make here. Stella and Dot – Stella and Dot is a company specifically to help female entrepreneurs. You can get started with a kit for as little as $199. This will get you $350 worth of jewelry and accessories to help you start selling in person and/or online. Uber – Everyone has heard of Uber at this point, but did you know you can also get discounts on certain phone plans as well as different bonuses depending on where you live? Read more about all the perks here. UberEATS – Did you know you can deliver food instead of people with UberEATS? Plus, you may even be eligible to use a bike or scooter instead of a vehicle. Teach English Online – There are several great companies that you can get started working with that allow you to set your own hours while teaching English online! VIPKid – If you have a bachelor’s degree you can start making between $17 and $22 per hour. SayABC – No lesson planning involved! Teach from home on your own schedule. Qkids – Great for adults still finishing up their degrees! QKids accepts people still in school! If you are in the position of needing more money to meet your goals, then it’s time to get creative with your time and talents. Don’t feel like a part-time position or working at the local grocery store are “beneath you.” Do what you have to do to stop just surviving and start thriving instead. 22 Summer Entrepreneur Jobs. Earn Extra Cash this Summer and Be Your Own Boss. Before you start slashing debt, make sure you have slashed your budget costs as much as possible. Dave Ramsey says, “Live like no one else so that later, you can live like no one else.” He means living crazy frugal, not spending money, not going out so that later in life you can live with financial freedom. Now that you know your situation, and you’ve made the necessary changes, what can you do to start finally tackling that debt? Get a plan. For most people, this is the debt snowball where you start paying off your smallest amounts first. Keep going. – Tom and I have continued to throw any additional funds we can find toward paying off our last debt. Start following other people’s debt payoff’s on Instagram. I have personally been sharing ours on YouTube. The last major thing I recommend, and I know sounds totally backward, is getting yourself informed! Get professional help. For years I heard different places mention Dave Ramsey’s Financial Peace University and I always thought I didn’t have enough money to afford the class. The truth is, that was a “poor man’s mindset.” I had plenty of money. I know because I had been wasting it in all the wrong places! After finally taking the class, my eyes were opened and for the first time we are getting on track with our finances and our debt and it feels awesome. You can get started with my budget bundle or jump all in with Financial Peace University. Do a Google search for local classes or get started at home. “Take the first step in faith. You don’t have to see the whole staircase just take the first step.” -Martin Luther King Jr.